Turn left out of the gate and walk down the road for about half a mile. Take the second track on the right signposted to Baysbrown. Follow the path across the valley and turn left after the bridge onto the path besides the beck. After passing the campsite cross the bridge, and just before the track joins the road bear right on to the path signed to the village centre. Stay on this until it emerges onto the road near the Wainwright Inn. Turn right and walk a short distance past the Inn, then turn right onto a path signed to Elterwater. Cross the bridge then follow the path to the left which joins the quarry road and then drops down to Elterwater village. From Elterwater take the path that starts in the NT car park and follow it besides the beck and then through the trees to arrive at Elterwater lake and it's superb viewpoint backed by the Langdale Pikes. 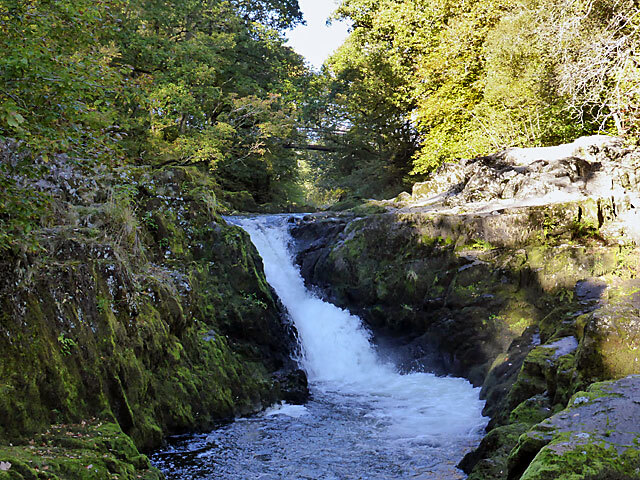 Continue on the path besides what is now the river Brathy to Skelwith Force which is just past a bridge. 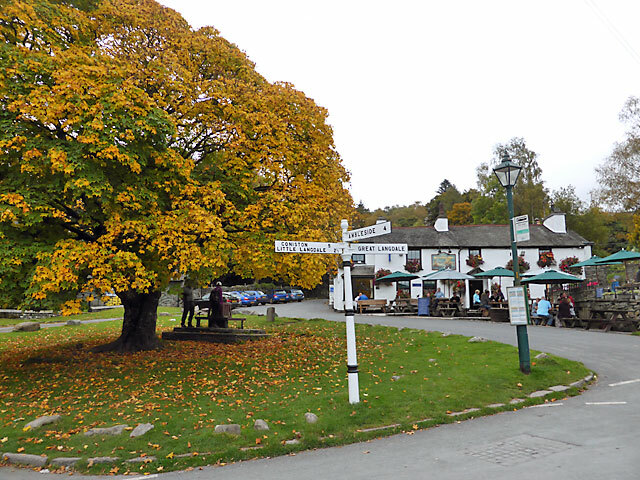 Skelwith Bridge is a short distance further on with it's pub, cafe and shop. To return cross the road bridge and go up the road for a short distance to access a path signed to Elterwater. This brings you back to the bridge just above the falls. 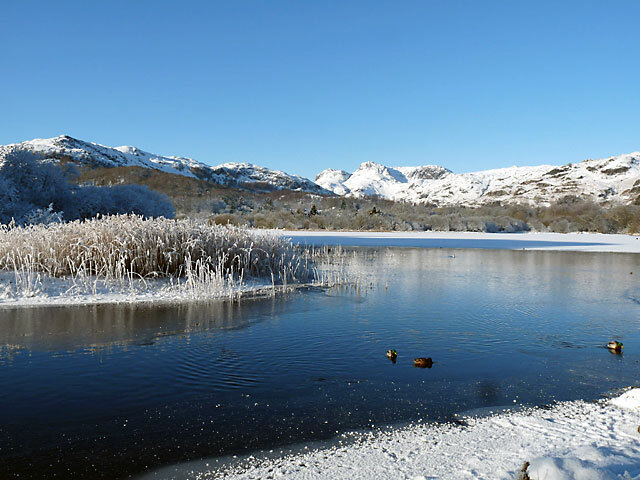 Turn left and follow the path back to Elterwater with superb views ahead. At Elterwater turn left and then right up the quarry road. At the top of the road there is a viewpoint overlooking the huge quarry. Follow the signs to Great Langdale through the quarry and up to a narrow road. Turn right signed to Great Langdale, pass Baysbrown farm and then the track through the woods to Oak Howe. Turn right here signed to Great Langdale and cross the bridge back across the valley, finally turning left at the road back to the cottages. 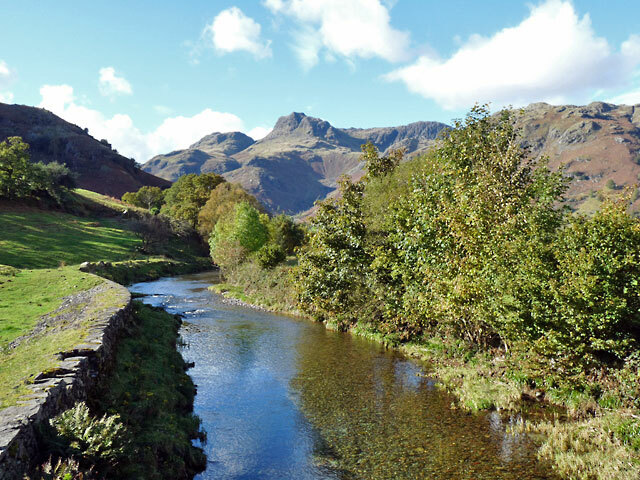 The Langdale Pikes from the bridge over Great Langdale beck.